Presentations of the team of the Universita degli Studi di Napoli Federico II (UNINA) in the double special session on “Complexity, data science and statistics through visualization and classification” at the European Conference on Data Analysis (ECDA 2019), Bayreuth (Germany), 18-20 March 2019. Siciliano R, Pandolfo G & D'Ambrosio A (2019), Enhancements of Probabilistic Boosted-Oriented Clustering, presentation at the European Conference on Data Analysis (ECDA 2019), Bayreuth (Germany), 19 March 2019. Staiano M, Pandolfo G, Aspinall R (2019), Interactive Visualization of Story-Boards: a Case Study of Long Time Series about Agriculture in Scotland, presentation at the European Conference on Data Analysis (ECDA 2019), Bayreuth (Germany), 19 March 2019. Pandolfo G & D'Ambrosio A (2019), Nonparametric clustering of spherical data, presentation at the European Conference on Data Analysis (ECDA 2019), Bayreuth (Germany), 19 March 2019. 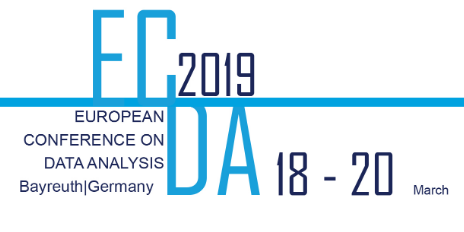 Iorio C, Pandolfo G & Siciliano R (2019), Spatially weighted exploratory regression tree: a quantitative story-telling proposal, presentation at the European Conference on Data Analysis (ECDA 2019), Bayreuth (Germany), 19 March 2019. D'Ambrosio A (2019), Median Constrained Bucket Order: a way to think about tied rankings, presentation at the European Conference on Data Analysis (ECDA 2019), Bayreuth (Germany), 19 March 2019. ECDA 2019: Presentation by Iorio et al.